In their new book Trust Us, We’re Experts! : How Industry Manipulates Science and Gambles with Your Future, Sheldon Rampton and John Stauber, authors of Toxic Sludge Is Good For You, offer a chilling exposé on the manufacturing of "independent experts." Public relations firms and corporations know well how to exploit your trust to get you to buy what they have to sell: Let you hear it from a neutral third party, like a professor or a pediatrician or a soccer mom or a watchdog group. The problem is, these third parties are usually anything but neutral. They have been handpicked, cultivated, and meticulously packaged in order to make you believe what they have to say—preferably in an "objective" format like a news show or a letter to the editor. And in some cases, they have been paid handsomely for their "opinions." You think that all grassroots organizations are truly grassroots? In 1993, a group called Mothers Opposing Pollution (MOP) appeared, calling itself "the largest women’s environmental group in Australia, with thousands of supporters across the country." Their cause: A campaign against plastic milk bottles. It turned out that the group’s spokesperson, Alana Maloney, was in truth a woman named Janet Rundle, the business partner of a man who did P.R. for the Association of Liquidpaperboard Carton Manufacturers—the makers of paper milk cartons. 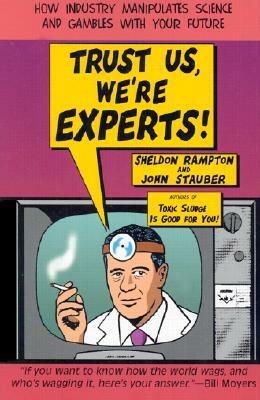 Sheldon Rampton and John Stauber are the bestselling authors of Weapons of Mass Deception, Toxic Sludge Is Good for You!, Banana Republicans, and Trust Us, We're Experts! Stauber is the founder and director of the Center for Media & Democracy. He and Rampton write and edit the quarterly PR Watch.